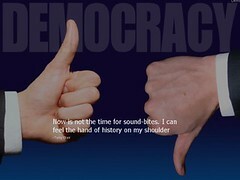 In school, the first definition of democracy we learn is “a system of government for the people, by the people”. Even your average 13 year old could argue that ‘the people’ should be a part of their own democracy. I argue that the actions of the Makana Municipality in one specific issue, what I like to refer to as “the car wash controversy”, has not only excluded ‘the people’, but also blatantly disregards the needs of these people and the municipalities responsibilities towards them. Grahamstown is not the city of gold. Hell, it’s not even the city of tin. If you’re looking for job opportunities, this is certainly not the town to venture into. There are no major industries, no big businesses or factories (that I know of at least) and as an unskilled worker your best hopes are Pick and Pay or a petrol station. You would imagine that in a town where unemployment is rife and many people have to look for jobs in neighboring towns and cities (public transport costs are not as friendly as they used to be), the local municipality would establish job creation initiatives and skills development programes? And so they did. In the form of the municipality car wash on Beaufort street. Costing more than R1million, this ‘majestic’ car washing facility stands tall and proud- right next to an informal business, Liyakhanya Car Wash, which has been operating in the neighboring taxi rank for 4 years. A summary of the situation: The municipality made an agreement with the workers at Liyakhanya that on completion of the new car wash premises they would be moved in and taught the necessary business skills to operate and maintain a successful operation. All was good, and everyone was happy. Until the building was completed and other individuals were named beneficiaries instead. It is at this point that the story becomes a bit hazy. No one has really identified a solid reason for the change of heart, but this hasn’t stopped people from speculating. Corruption. The first thought on everyone’s mind. But wait folks, the plot thickens. Now Liyakhanya has been served with an eviction notice for not having a lease agreement with the municipality (the taxi rank it operates from is municipal land). But for 4 year no one has raised an eyebrow over their lack of a lease. Afraid of a little friendly competition perhaps? For many of the workers at Liyakhanya, it is their only source of income. They now face unemployment. A real tragedy, considering they are the lucky ones in a town where more than half of the population is unemployed, who have actually managed to secure a job. Entrepreneurs choked by the hands of bureaucracy? The very hand that (in theory) feeds them? Lets admit, there is nothing sinister about the new municipality premises. A wonderful job creation initiative with the aim of benefiting those in the Grahamstown community who need it the most. Fine, so they’ve moved other people in for whatever reason, then why add insult to injury to those who were promised the new premises, and now evict them from theirs? The municipality argues it has great plans for the land which is now a taxi rank. The long term goal is to develop a small business hub, where individuals can set up stalls and shops, and pay only a small fee for rental. Again, a wonderful idea- which will not materialize for a good couple of years. So why the immediate eviction? I’ve stewed over this for long enough, and yet still, a simple justified answer alludes me. In an interview with a municipal official who works closely with the car wash project, an open minded, diplomatic and reasonable man, he expressed his personal feelings that all hope is not lost for the workers of Liyakhanya. He believed that through negotiations an amicable solution could be found. Finally! Some sense amongst all the insanity of the situation. If only the parties were sitting at a negotiating table instead of meeting before a judge in court (the eviction notice is currently being challenged by Liyakhanya). As a local municipality, an arm of the South African government, your every action should serve the interests of your constituents. Suffocating those who attempt to create employment for themselves when you cannot provide it, is not an action for the good of the local community. To suffer at the hands of bureaucratic bull***t, political agendas and downright selfish aims of making a little cash on the side, is not what the citizens of a democracy should face. Why not sit down at the proverbial round table (hell, a couple of empty beer crates would suffice) and engage in dialogue. Discuss the future of the premises, allow the people to air their fears and grievances, see how they can fit in to your plans and make them a part of seeing them through to fruition. Making plans for the people and then excluding those very people from your decision making not only casts a shadow over your good intentions, but defeats the purpose of a democracy in which an electorate is engaged and actively apart of. and i still wanted to look for a job in grahamstown!